See more clearly and dramatically reduce glare and reflection instantly. See more clearly and dramatically reduce glare and reflection instantly. Eagle Eyes patented triple-filter, polarized lenses block all harmful blue, violet and ultraviolet light to help preserve and enhance your vision. Wear them year-round to see better in sun, smog, haze, snow, rain and overcast conditions. Eagle Eyes preserve your night vision when you enter buildings and lets you see through water instead of just the surface.Developed by NASA scientists and worn by professionals where safety and protection are essential, these sunglasses are lightweight, comfortable and rugged The all new Eagle Eye Extremes come with the same state-of-the-art Eagle Eyes lenses and feature a sporty, stylish wrap-around design. Eagle Eye Extremes are made from sturdy nickle silver material and incorporate soft rocker nose pads and rubberized temple ends. Comfort, durability and style is what you get with the Extremes! Awesome! Very proud of these glasses! 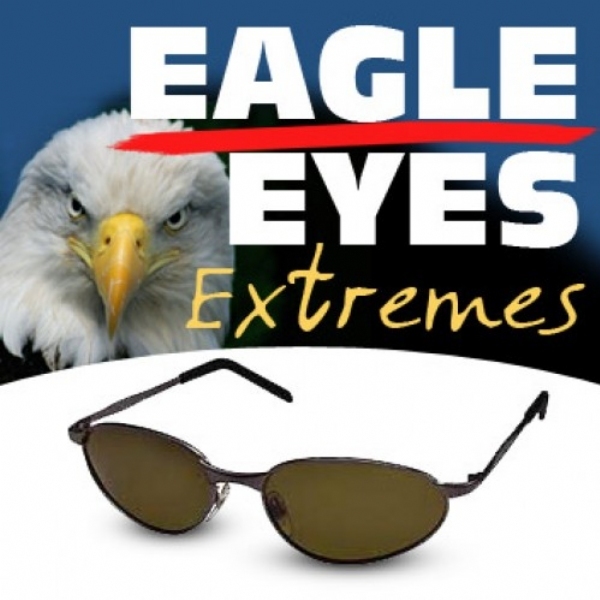 I love my Eagle Eye Extreme Sunglasses. Very easy on the eye in bright sunlight. No more eye watering and eyes feel calmer. I bought another pair to never be without. Great Quality.